You’re not the only one – lots of people struggle when it comes to representing ‘the man’. I’VE BEEN THINKING about team leading a lot lately. When revisiting advice a friend asked for when transitioning to a leadership position, I decided to flesh out some of my thoughts. Most of the following will hopefully be helpful to anyone leading a team or any manager, although some will be more relevant to leaders of developers and developers transitioning into leadership roles. If it helps anyone, great. I’ve struggled with this and have seen almost every person in a leadership position struggle with it as well, but trust me, it’s really worth getting over. If someone can do something 80% as well as you – or better – delegate. Don’t feel like you have to touch everything and be the best or most active person on the team. You’re responsible for making sure everyone else does their best and grows. If you don’t delegate enough, people feel like they’re only doing the boring stuff and they’ll feel undervalued as a result. Always try to find more ways to delegate. Don’t just give people work to do in small orchestrated pieces. It makes people more reliant on you and they learn less. Make yourself as redundant in the day-to-day work as possible. Ensure the team has the skills, knowledge and experience to get things done. You don’t need to have the final say on everything and solve every hard problem. This gives you more time to work on the stuff only you can do. On the flip side, as you start to delegate more, you will become less familiar with the actual day-to-day and feel like more of an impostor. Don’t let this stop you from delegating. Keep the team as efficient as possible. Protect them from distractions. This includes telling them about potential disruptive process changes being considered and meetings they’d like to be in but really don’t need to be. Emphasise knowledge sharing. For example, avoid someone fixing bugs related to X just because they implemented X originally – taking responsibility is good but often leads to one person holding exclusive knowledge of something. Give someone territory and they’ll likely become defensive. Always look for ways to make team members’ lives easier so they can do their best work. Shield them from company politics, pointless meetings and other distractions. Determine the type of lead you will be. Don’t identify yourself or equate your title with dependency; the title isn’t an excuse to micromanage. People shouldn’t be at your mercy or at your beck and call. Focus on getting to a point where everyone can learn from each other and get their best possible work done. Keep an ear to the ground. Too much talk within the team might indicate a lack of productivity, decision making, or that they’re enjoying themselves too much. If it’s a bit too quiet, it might mean everyone has their head down and, in the case of developers, there’ll be problems once their code is integrated, or that people might not be getting along. You have to be an excellent communicator. There’s no room for negotiation here. Be assertive, clear and honest. Being specific and confident in what you’re saying about a task is critical. You can’t rely on intention. People will do exactly as you say. Discover and minimise misunderstandings early. This is a simple one but when messaging a team member about having a chat with them, give them a rough idea what it’s about in advance. The beautiful line graph above shows that the “importance of giving a heads up” is inversely proportional to “frequency of contact”. 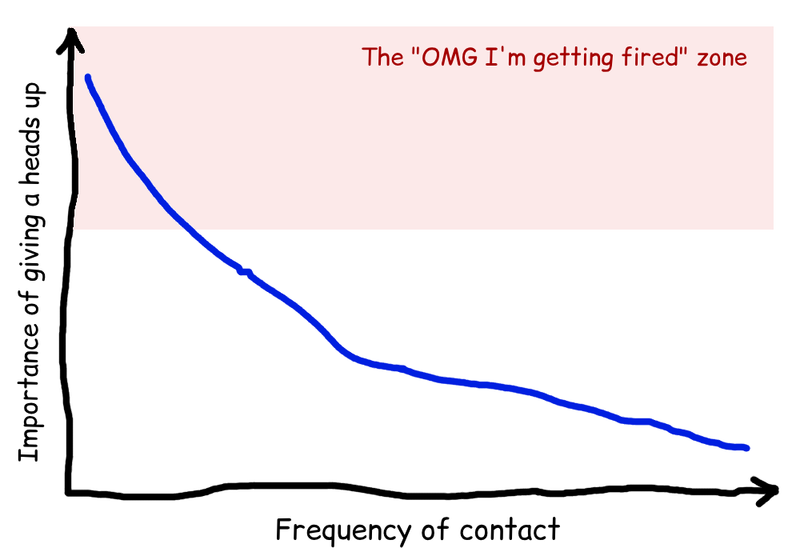 Watch out for the “OMG I’m getting fired” zone if contact is minimal. Disagreements aren’t criticism. They’re healthy as long as they don’t block progression or damage relationships. Don’t be mean, but say what you mean. Make sure everyone has a fair say. Encourage your team to challenge you, to respectfully tell you when you’re wrong. The last thing you want is for them to be afraid to point out when you’re wrong. Be honest when you don’t know X and don’t be afraid to admit you’re learning – everyone is. Voice their concerns and share updates with them. Celebrate and recognise their hard work and achievements. Be an umbrella. Take negative criticism for them and only pass it down if they really need to hear it. Having anyone as a lead makes the team stronger, no matter who it is. You now represent “the man”. Understand top-down decisions; you need to in order to believe in them and to then make others believe in them. Support your superiors. If they don’t understand the challenges you’re facing, that’s your fault. Manage stakeholder expectations as well as internal perspectives of your team and their work. For example, criticise team members if they’re less than nice with other teams – they’re representing the team. Don’t go overboard on process. Start small, experiment and keep what works. Team members’ past experiences and opinions will vary a lot. Make it clear that the process is evolving and can always be improved with a suggestion from a team member. Each team is different, you’ll discover the best processes. Set as few rules as possible and strive for minimal viable bureaucracy or process. I’d recommend doing daily stand-up meetings. They’re really good when done properly. It should ideally be at the same time every day, as early as possible. People shouldn’t go into too much detail or interject when others are talking. If a discussion needs to happen, finish the stand-up first, then anyone can stay for the discussion if they want. Schedule a regular chat with each person individually. Give them a chance to highlight successes or issues. This could be related to colleagues, your leadership, the company, home life, etc. Listen and empathise. This is also a good time to give feedback – but keep it light. Try to give good with the bad. These conversations are really good; you’ll be surprised by what comes up or how honest people will be. Leadership roles are people-oriented and people problems are not trivial. Even the toughest bugs are a lot more straightforward to solve than figuring out how to keep someone happy. Keeping morale high has to be a focus and part of that is mixing the right people. Each individual person can differ in what drives them. Getting great people in your team is key. Worries about how best to educate and manage fade away and you’re left to figure out how best to delegate. Adam Lynch is leading the development of a new product at Teamwork.com and is the co-author of Developing an Electron Edge. A version of this article previously appeared on his website.